Just when India and China are engaged in a border stand-off triggered by Chinese incursion in Ladakh, Nepal's Maoist leader and former Prime Minister Pushpa Kumar Dahal Prachanda today called for trilateral cooperation between India, China and Nepal for economic prosperity of the region. "I believe an economically sound Nepal will be in the interest of both India and China,'' Prachanda said while delivering a lecture here. The economic prosperity of Nepalese would also to a large extent address the security concerns of both India and China, he added. Prachanda, who is here on a four-day visit, will meet PM Manmohan Singh and External Affairs Minister Salman Khurshid tomorrow. He will also meet UPA chairperson Sonia Gandhi and Opposition leaders. Prachanda is visiting India days after his trip to China, where he met Chinese President Xi Jinping. He made it clear that Nepal would not allow anti-India activities from its soil. 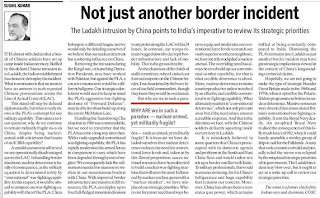 The face-off between India and China in north Ladakh entered its 15th day today with Chinese troops pitching their fifth tent east of Raki Nullah and 30 km south-east from India’s advanced landing ground Daulat Beg Oldie (DBO). The Indian side got its first indication of Chinese gradual build-up in the standoff area when the troops noticed three vehicles moving between the Chinese tents and their nearest backup location 25 km away, suggesting replenishment of supplies, sources said. Armed troops of both sides continue to hold banners asking the other to withdraw under the April 2005 agreement, which lays down a protocol for soldiers coming face-to-face along the LAC. The dry nullah stands between the armed troops of both sides as they confront each other 100 metres apart. Neither side has so far displayed heavy weapons. The two flag meetings held so far between the Brigadier-level officers on either side have ended in a deadlock. India’s top strategy body - the China Study Group - headed by the National Security Adviser has opted for diplomatic resolution while asking the Army to maintain pressure. 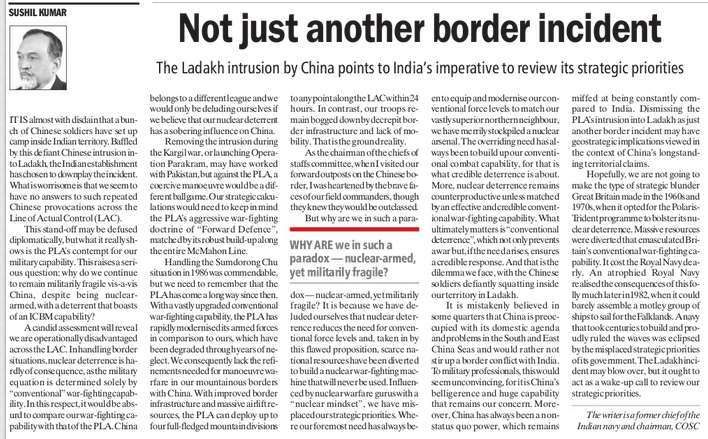 Efforts to break the impasse over the incursion are yielding no results because of Chinese insistence that some bunkers constructed by India at a key vantage point be dismantled. China is understood to have laid down this condition before the Indian side for pulling back from the place 19 km inside the Indian territory in DBO where around 50 troops have been camping for the past two weeks, sources said. 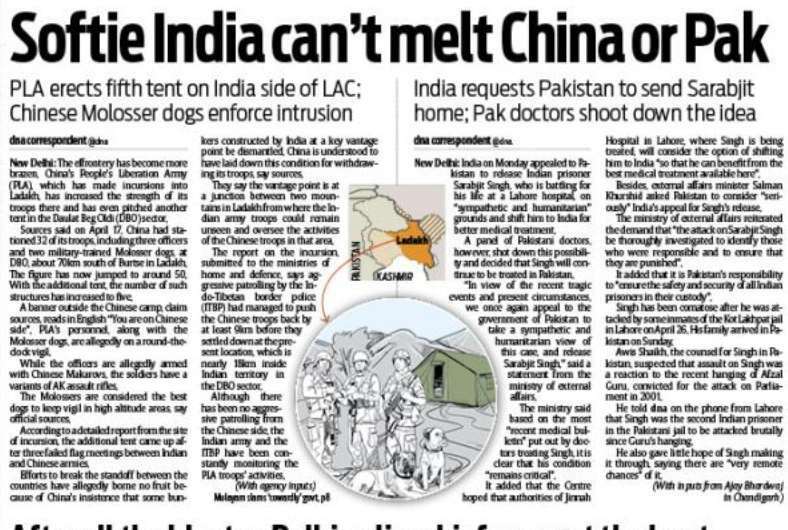 The government is seized of this issue at the meetings of the China Study Group headed by the National Security Adviser Shivshankar Menon and including Secretaries of key ministries such as Defence, Home and External Affairs, sources said. The rigidity shown by the Chinese over its demand is also one of the reasons behind more flag meetings between the two sides not being held for over a week, they said. India and China have kept the window of joint military exercises planned for later this year open and are in the process of chalking out details of these exercises. 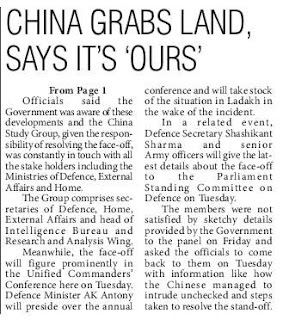 Amidst tension between the two countries along the Line of Actual Control (LAC) in northern Ladakh, a small Indian military delegation led by a Brigadier was in China from April 23 to 26 for a “consultation meeting”. The two sides have decided to conduct a “planning conference” here in July. This conference will study the conduct and scope of the joint exercises planned in October in Chengdu province of China. A small Chinese military delegation will visit New Delhi in July to work out the dates and logistics for the exercise. The exercise in China is on track so far, a source said. Indian and Chinese forces have conducted two joint military exercises in Karnataka (December 2008) and Kunming (China) in 2007. 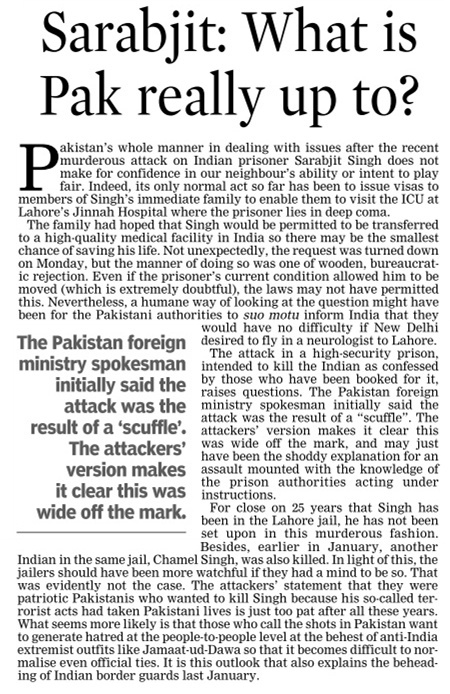 The exercises came to an abrupt halt in 2009 after Beijing refused visa to a serving Indian General on the premise that he was posted in Jammu and Kashmir. The resumption in joint exercises was announced in New Delhi in September last year. Samajwadi Party chief Mulayam Singh Yadav today slammed the UPA government for "acting coy" on the issue of Chinese incursions in Ladakh and went on to term it as "cowardly, incompetent and good for nothing". Speaking during Zero Hour, Mulayam said China was India's biggest enemy and had been occupying huge chunks of our land with the government watching silently. Objecting to the forthcoming visit of Foreign Minister Salman Khurshid to China to prepare for the next month's visit of Chinese Premiere Li Keqiang to India, he said India had vowed after the 1962 war not to engage with China until it vacated every inch of the Indian land. "This is the weakest government ever," he said supported by BJD's Bhartruhari Mahtab and TMC's Sudeep Bandopadhyay who wanted the PM to allay concerns of the Lok Sabha on the issue. 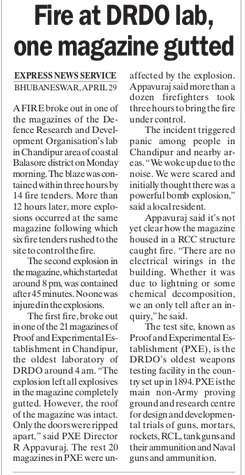 The SP chief said the Army had assured of removing intruders, but the government was not issuing it the relevant instructions. "The government is acting in a cowardly manner," SP supremo said adding that the threat of war from China and not Pakistan. 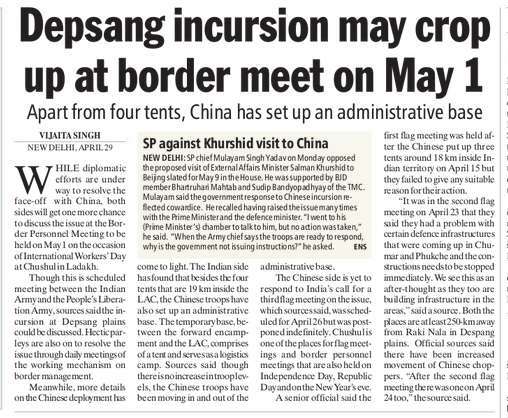 Khurshid is set to travel to Beijing on May 9 with the SP creating a ruckus in the LS on the matter. SP members raised slogans against the visit as soon as LS assembled at 11 am. The Speaker had to adjourn the House till 12 noon. Later, Mulayam Singh raised the issue of Chinese incursions amid sloganeering by BJP members who were seeking resignations of the PM and the Law Minister on the CBI's affidavit to the court that the Law Minister had sought report on coal block allocations. Mulayam said he had personally raised the issue of Chinese aggression with the PM, but no action was taken. "I went to PM's chamber to talk to him. But no action was taken," he said. 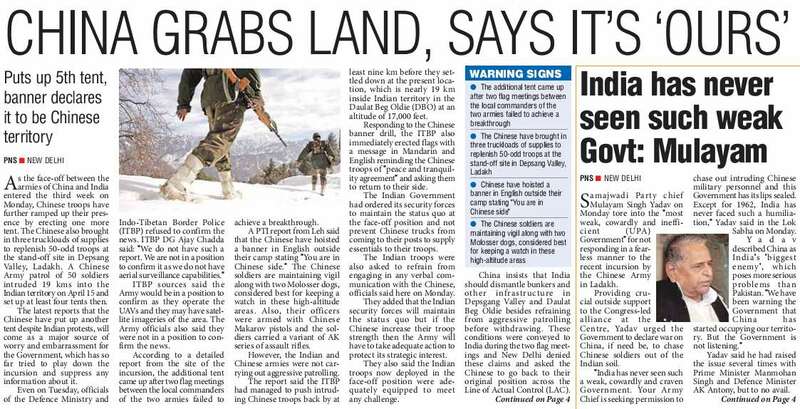 The SP's claim is-one lakh sq km of the Indian territory has been occupied by China. The Lok Sabha and the Rajya Sabha were adjourned till 12 noon, then till 2 pm and finally for the day over BJP protesting on the JPC issue and the CBI's affidavit in coal scam; SP attacking the government on Chinese incursions; and Telangana MPs demanding a separate state. A love for posting their latest pictures and discussing sensitive defence-related issues on social networking sites has landed three Navy officers in the soup. 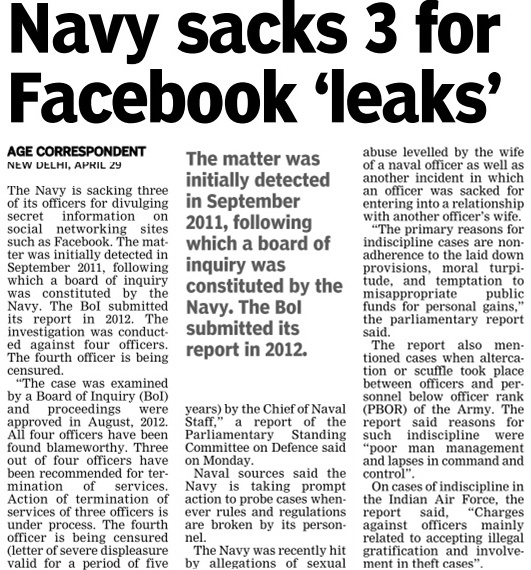 The Navy Board of Inquiry (BoI) has recommended termination of their services. Another officer accused of similar acts is being censured by the Navy Chief. 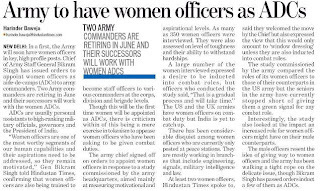 They will lose their jobs once the Ministry of Defence okays the board findings. All four were found blameworthy of posting secret information on social networking sites in September 2011. The MoD has informed the parliamentary standing committee about the action on these four officers, which in turn, released its report today. The three officers to be terminated occupy important posts at sensitive locations. 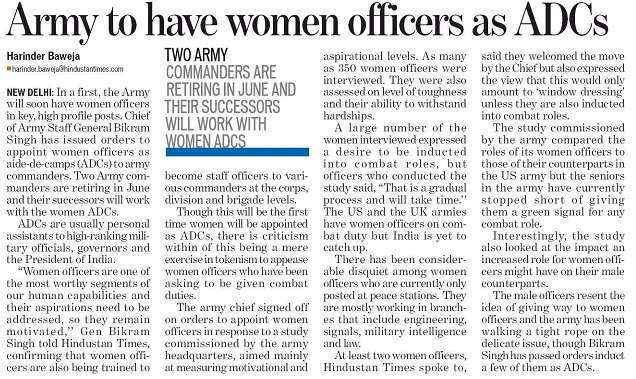 Two of them are Commander-level (equal to Lt Colonel of the Army) and one is a Lt Commander. As each one of them has put in nine to 14 years of service, all of them are well aware of the ban on posting comments and their own pictures that revealed locations, on networking sites. One of them is posted on sea-borne aircraft carrier INS Viraat, while the other two are posted in the Western Naval Command. The carrier is at present undergoing a re-fit at Kochi. A BoI proceedings were conducted at the Mumbai-based Western Naval Command (WNC). 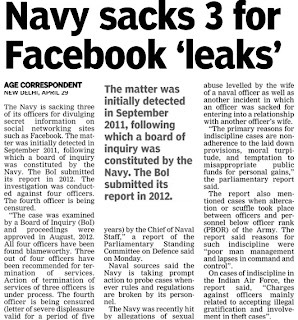 Before ordering an inquiry, the four officers were tracked on social networking sites and allegedly found to be posting confidential information, including location of warships, armaments being carried by them and their patrolling patterns. Over the past few years, the armed forces have been issuing regular circulars, asking officers not to post service-related matters on social networking websites like Facebook and Orkut. The officers cannot even reveal their ranks or the city where they work while posting pictures of weaponry, missiles, aircraft, warships and submarines. Posting information about patrolling duties is a strict no-no. The MoD also informed the committee that an officer of the rank of commodore was found in a compromising position with a Russian woman and after being found culpable by a one-man inquiry, his services were terminated in April 2011. The ministry said “moral turpitude and temptation to misappropriate public funds for personal gains” were the primary reasons behind cases of indiscipline in the Navy. Mulayam Singh Yadav today attacked the government over the incursion of Chinese troops in Ladakh, accused it of being "cowardly and incompetent," and warned that China "is the biggest enemy" and "Pakistan is no threat to India." The Samajwadi Party chief was among several members who voiced concern in the Lok Sabha at the stand-off that continues with China at the border since the middle of this month, and slammed the UPA government that he lends crucial external support to, for going ahead with External Affairs Minister Salman Khurshid's scheduled visit to Beijing early next month. Mr Yadav alleged that the Chinese incursion was designed to annexe Indian territory. "I have been raising this issue for the past eight years. I had warned that that there will be a repeat of 1962. I even went and met the Prime Minister in his chamber, yet there was no response. Now, Salman Khursid is going to China. To do what? Beg before them?" he said angrily. On April 15, a Chinese platoon set up camp 19 kilometres inside Indian territory in the Depsang Valley in Ladakh. India has tried through meetings with local military commanders and through diplomatic channels to get China to vacate the spot. 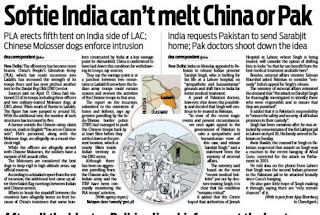 But China insists that it has not intruded into Indian territory. The Indian government does not want to escalate hostilities and Mr Khurshid has said it must "remain an isolated incident and should not spill over into the larger spectrum of our relationship with China." 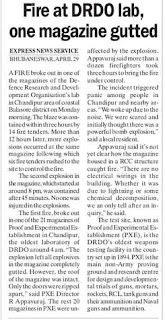 Army sources have said that they are treating the incursion as a localised incident and have ruled out military action, though they admit that the stand-off could continue for weeks. Mr Yadav, who is also a former Defence Minister said today that he believed the Indian Army was ready to remove all intruders but had not been given a go-ahead by the government. He demanded to know from the Prime Minister why the government was being "cowardly, incompetent and good for nothing" in dealing with China. New Delhi, April 29: A turf war among Indian forces is shaping policy in the terrain of tent war while Indian and Chinese troops are in a face-off in Ladakh’s Daulat Beg Oldi sector. 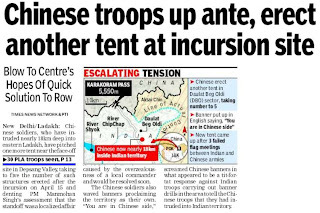 The Indian Army and Indo-Tibetan Border Police (ITBP) troops have pitched tents opposite a Chinese camp at Raki Nala in eastern Ladakh where the face-off between the forces of the two countries is now in its 14th day. But the absence of a clear directive from the government on who is in charge can lead to confusion over who is really in command of the Indian camp at the disputed border — is it the army or is it the ITBP? The Indian Army has re-stated its demand for operational command of five battalions of the ITBP in Ladakh. 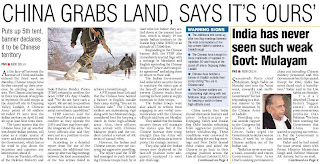 Indeed, the army wants operational command of the ITBP all along the border with China but it has suggested a start with Ladakh from where it has reported the maximum number of transgressions of Chinese patrols. But the ministry of home affairs (MHA) has rejected the demand as it had done in the past. The request is now before the China Study Group (CSG) headed by national security adviser Shivshankar Menon. The CSG comprises the secretaries of the home, defence and external affairs ministries, the cabinet secretary, the vice-chief of army staff and officials that the group co-opts from time to time. Lt General J.S. Bajwa, who recently retired as director general (infantry), told a meeting here on Sunday that the lack of operational command over the ITBP was a hindrance in a sensitive terrain. BJP MP Tarun Vijay was one of the organisers of the meeting. The army had first asked for operational command of the ITBP on the border in 1986. 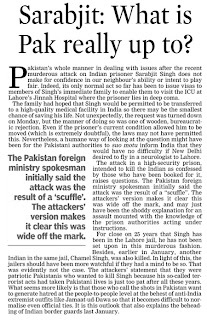 But the demands became more insistent since 1999 when a Chinese intrusion at Chip Chap in the DBO sector was reported while Indian troops were engaged in the Kargil war with Pakistan. The army says that its 14 Corps chief stationed at Leh should be in charge of all forces. In the past, the home ministry had rejected the demand. The MHA told the government that the ITBP was raised specifically for the China frontier after the 1962 war. In addition, the MHA argued, peacetime border management is done by central police forces according to international norms and the army should be employed only in a “hot war” situation. The army has counter-argued: in unsettled borders, a “hot war” situation can flare up at any time and escalate fast. Technically, the Chinese also have border guards on the Line of Actual Control. Even the platoon, which has pitched tents at Raki Nala near DBO — that the Indian government has said is an intrusion of 19km inside India — belongs to the border guards. But the Chinese border guards are part of the People’s Liberation Army and is directly under its command. In India, however, central police forces like the ITBP are under the home ministry, and the army, navy, air force and the Coast Guard are under the defence ministry. The Indian Army has also argued that units of the BSF, that also reports to the MHA, deployed on the Line of Control (LoC) with Pakistan are under its operational command. In the Northeast, the Assam Rifles, engaged in counter-insurgency operations, is also under the operational command of the army. The Indian government is, however, hesitant to follow a similar system along the undefined Line of Actual Control because placing a police force under the army could be construed as an aggressive move. At Raki Nala, however, the troops of the ITBP and the army, from posts in Bush Area (ITBP) and Track Junction, were reported to be getting along well. 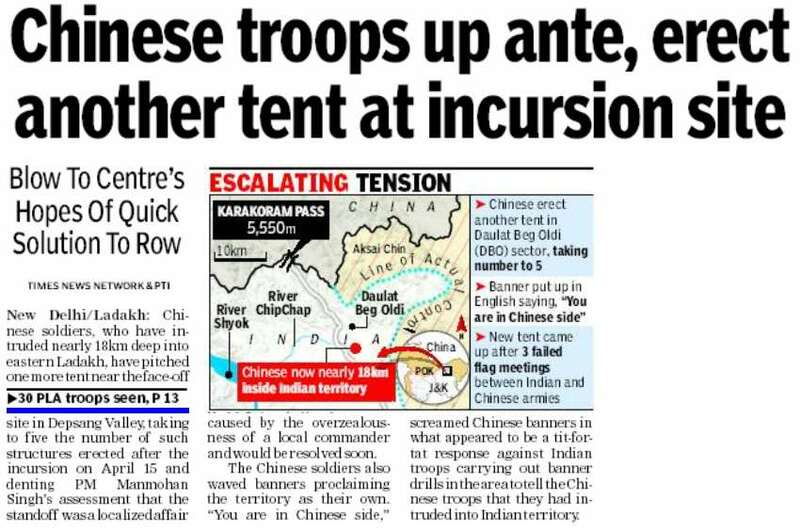 Reports sourced from the army said about 10 sentries each from the Indian and Chinese sides are in a face-off barely 100 metres apart and keep guard 24 hours. It is bitterly cold with temperatures dropping well below -10°C at night but the troops are holding up banners, each side asking the other to return to their original positions. New Delhi, Apr. 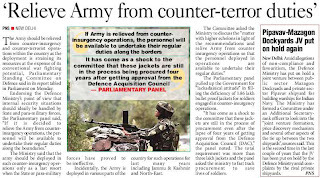 29 (ANI): A parliamentary panel, which observed that deployment in counter-insurgency operations was straining the resources of the Indian Army, has said that the force should be relieved from these tasks to focus on undertaking its regular conventional duties. The Standing Committee on Defence, which tabled its report today, expressed concern for saving lives of soldiers in counter-terrorist operations and criticized the Defence Ministry for its 'lackadaisical attitude' for doing away with the deficiency of around 1.86 lakh bullet-proof jackets for Army troops. Commenting on the army's role in counter-terrorism operations, it said the force's commitments towards counter-insurgency operations strain its resources and is at the expense of its conventional war-fighting potential. 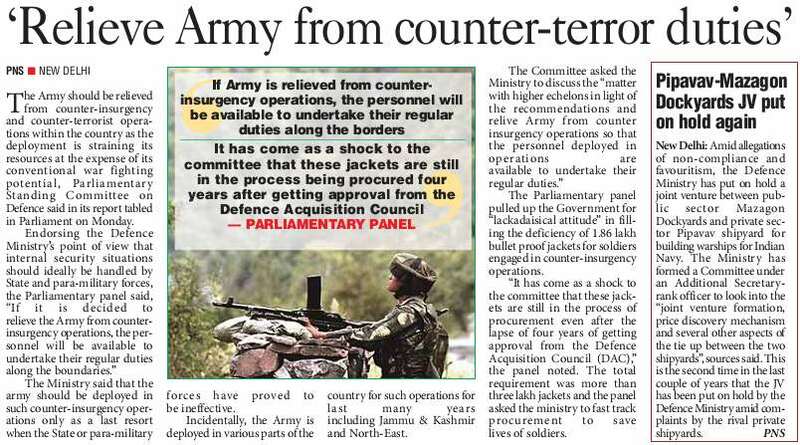 "The Committee endorse the Defence Ministry's views that counter-insurgency operations should ideally be conducted by the state-police or central police forces as the matter lies within the domain of internal security and the Army should be deployed only as the last resort," the report said. Anglo-Italian defence firm AgustaWestland has participated in bids to procure choppers for Indian Navy and Coast Guard as no decision has been taken by the government to debar it from the procurement process, Defence Minister A K Antony told the Lok Sabha today. In a written reply to the House, he said the Request for Proposal (RFP) for procurement of the Naval Utility Helicopter(NUH)) was issued before commencement of CBI inquiry in the VVIP helicopter case. "Since no decision to debar the said company (AgustaWestland) from participation in the procurement process has so far been taken, the bids are under process," he said. On whether AgustaWestland has applied for tenders for supply of helicopters for the Indian Navy and Coast Guard, Antony said, "Yes... RFP for procurement of 56 NUH was issued in August 2012, prior to commencement of inquiry by CBI in the VVIP helicopter case." RFP for procurement of 14 twin-engine helicopters for the Indian Coast Guard was likewise issued in November last year, he added. "Only two companies have submitted bids for the NUH case and three companies submitted bids for the twin-engine helicopter case. The bidders include AgustaWestland," Antony said. In reply to a separate question on modernisation of Navy, he said, "The budget allocation of Indian Navy for 2013-14 is Rs 34,212.33 crore, out of which Rs 22,738.70 crore is earmarked for modernisation purpose." To a question over Main Battle Tanks (MBT) for the Indian Army, the Defence Minister said, "MBT Arjun Mark-I has been manufactured indigenously and Arjun Mark-II is under development. The T-90 tanks are manufactured indigenously by Ordnance Factory Board (OFB) under licensed production from the Original Equipment Manufacturer." He also told the House that the Future Main Battle Tank (FMBT) is under indigenous design and development. In reply to separate question on budgetary allocation for the year 2013-14, he said the services have been provided Rs 2,03,672.12 crore.